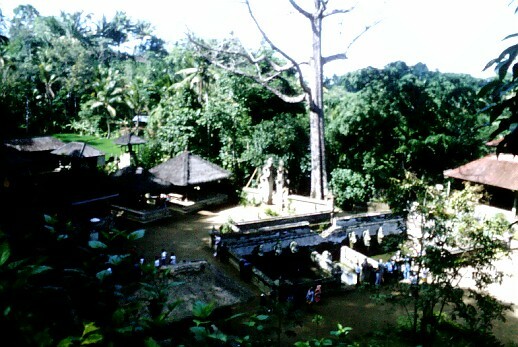 The next stop was Goa Gajah - the Elephant Cave. This ancient temple, situated around a carved cave entrance, is a major tourist attraction, with busloads of tourists arriving in the parking lot all the time. 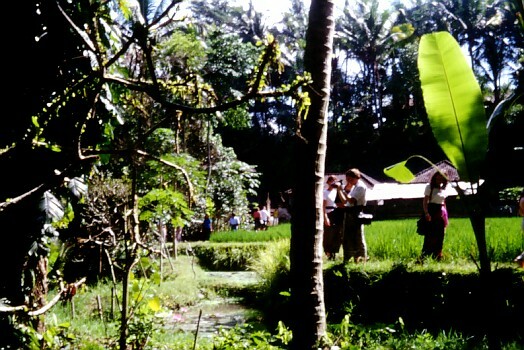 Out of respect for the temple, visitors are requested to wear sarongs, which we had brought with us from the States, much to Dewa's amazement! You walk down a series of steps to the temple. 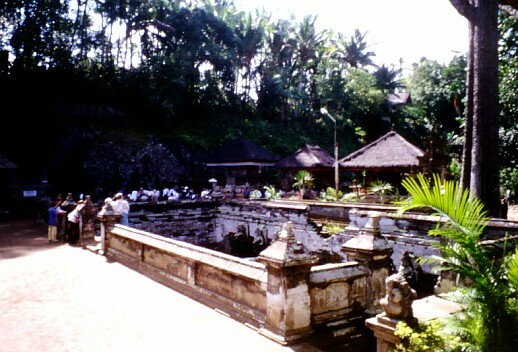 In common with many temples, Goa Gajah has springs and pools of holy water. This is a rather dried up pool - they probably only fill it when it is going to be used. 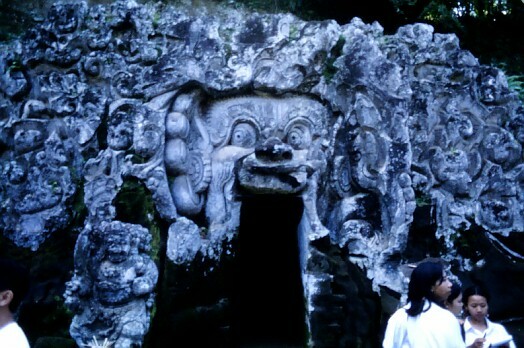 The famous cave entrance is elaborately carved. Inside the cave is a statue of the Hindu character Ganesh (Ganesa) - half elephant, half boy - from which the temple gets its name. 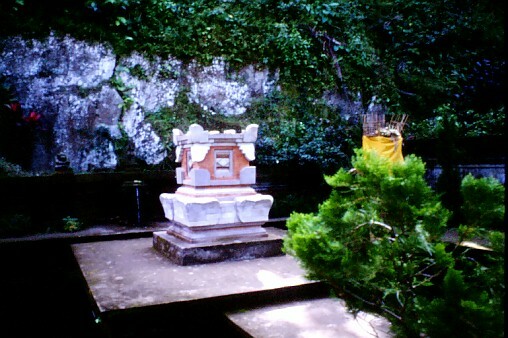 This is one of the springs of holy water. People were filling containers from it while we were there. Behind the temple is a rice field where they grow rice used in temple ceremonies, irrigated from the irrigation channel you see here. That's probably me with the bag, filming. You can see how lush this place is. 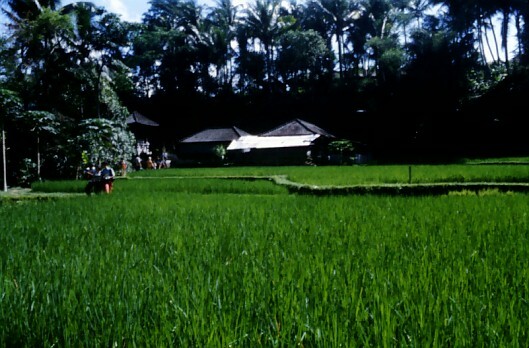 Another view of the rice field. This field is in a much further advanced stage of growth than the fields seen in earlier pictures, which were little more than ponds. Here the rice is at about the mid-stage of its life. 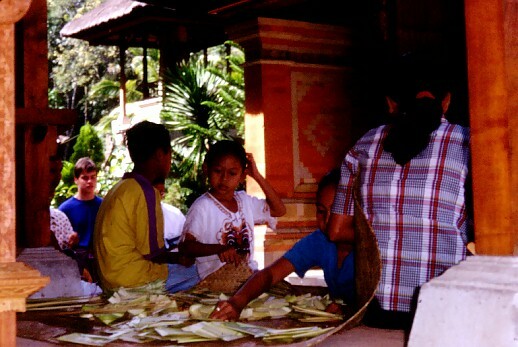 These people seemed to be working at the temple, and were making offering trays out of banana leaves. 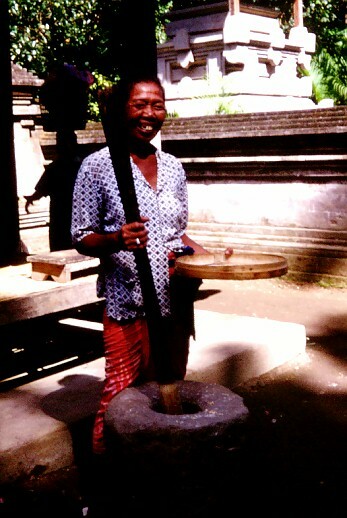 This lady was another one of the people that helped run the temple - she was grinding something up, I forget what (rice for rice-paste, maybe? ).